The aim is to help smallholders in Nepal improve the production and diversity of food crops. We will use satellite imagery and machine learning to identify crop types and crop health on smallholder farms. 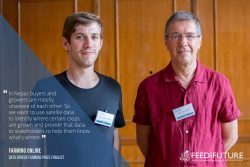 This data will form the basis of peer-to-peer knowledge transfer, in which smallholder farms can be paired by crop, soil type or aspect, to create a network with smallholders in similar situations to themselves. Smallholders will be asked to register their location on a website and we will work with the Nepalese Village Development Committees to validate which crops are being grown. We will use Synthetic Aperture Radar (SAR) and Short-Wave Infrared (SWIR) data sets to overcome the restrictions of cloud cover. The satellite data will be available online for interrogation by experts in tropical agriculture, including Nepalese agricultural extension services, to identify and advise farms in the practice of sustainable farming techniques.